As a kid, I’d get to request at least one meal per week. Mom would sit at the kitchen table on Sunday, pen and paper in hand, and ask everyone what they wanted for dinner over the next five days. It usually didn’t go that well. Asking on Sunday what someone wants to eat on Wednesday is a kin to asking Christine O’Donnell which Supreme Court rulings she most opposes. Since she doesn’t actually know what the Supreme Court is, naturally she has so clue how to answer this question (preferring to live her life according to her local coven rules…whew, dodged a bullet there, eh America?!). When it came to accurately predicting our cravings several days in advance, we were just as dumbfounded. This usually ended in a frustrated Mom (here she is, trying to give everyone what they want, and no one will take it), bratty kids (chicken again? Shoulda gotten our orders in! ), and a husband who eagerly requested beef stew every single week, summer heat be damned. Once in a while I’d come up with something I wanted. Fajitas, twice baked potatoes with extra bacon bits, spaghetti (still a family favorite) or cheese souffle (but only when Dad was away). I was always a rather expensive child, so naturally my real favorites were stuffed pork chops from the local gourmet market, Eddie’s of Roland Park. Eddie’s is an icon in Baltimore. It’s been a local tradition since 1944, with a Gourmet-to-go counter serving up tasty crab cakes, angel hair pasta with sun-dried tomatoes, Ceasar salad, shrimp salad and chicken salad, to name some of the more popular items. Their sandwich counter puts together some seriously delicious and creative combinations, mostly named after local schools and neighborhoods. I realize New York is home of the deli sandwich, but I have to say every time I head to Baltimore, I race over to Eddie’s for a rare house roast beef sandwich with horseradish on rye, or a Cloak and Dagger (my grandmother’s favorite). As a Roland Parker myself (both in neighborhood and alma mater), Eddie’s of Roland Park holds a sweet spot in my heart. Growing up, it was a gourmet grocer before gourmet grocer’s were all the rage. It was a neighborhood hot spot, a place to see and be seen, where friends and aquaintances bumped into each other in the post-school, pre-dinner rush. There was always a tid bit of local gossip being traded over the salad bar, and people had their favorite sandwich makers. The butchers recognized the regulars and went out of their way to make sure their crown roast of pork was trimmed just so. Holidays were always nuts; I loved stopping into Eddie’s with my mom before Thanksgiving and Christmas, when the chilly air and the hustle bustle of friendly faces and Christmas sweaters (hey, it was the ’80’s) created a perfect frenzied but festive atmosphere. Eddie’s always felt like a throw back, a place where several generations shopped. People had house accounts (dangerous once my brother and I got to be teenagers), the managers knew the names of many of the customers, and there was always someone offering to help you bring your bags to the car. It had that small town feel that I think is so lacking now, and that so many of us still crave. 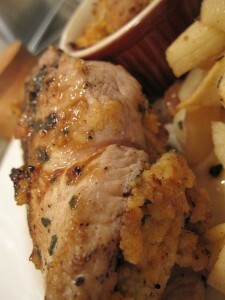 And those stuffed pork chops…dynamite. Every once in a blue moon my mom would splurge and we’d be in for a real treat. The kitchen smelled fantastic, the TV was off, the troops were happy. They were the perfect fall meal. Mom served them with baked apples, so naturally, when making these, I did the same. This is great comfort food. It’s turned chilly here over the last several days. The radiators are steaming and we’ve lit a fire several nights. The leaves are hued golden and tawny, orange and red, and they crunch under my feet and the tires of the car, announcing my arrival before I unlock the door. Seeing as I married a pork fanatic, who loves fall and Monday night football more than (almost) anything else, I figured I’d introduce him to stuffed pork chops a la Eddie’s to eliminate a case of the Mondays. They struck just the right note and left hubster wondering how he’d spent his entire life without an intimate knowledge of bread stuffed pork. So if you love fall, and football, and small town memories and Mom’s who care what you want for dinner, give these a try. Tip your hat to an old Baltimore tradition, no matter where you’re from. Feel good about having something warm and wonderful waiting when your loved ones come through the door, leaves crunching and mouths watering. In a large saute pan, add 2 tbsp butter, then add onion and celery. Saute until translucent and very fragrant, about 4 minutes. Season with salt and pepper, add half of the sage and half of the thyme. Add sausage back into pan, then add breadcrumbs. Remove from heat. Add stock slowly, stirring. As soon as it is moist, stop adding stock (you may not need it all). Taste for seasoning, add salt and pepper as needed. Preheat oven to 400. Season pork chops on both sides with salt and pepper and remaining herbs. Fill with stuffing mixture, then fold pork chop sides onto each other (you will likely have leftover stuffing. Put it into a baking dish and throw it into the oven for about 20 minutes. Serve as a side).Tie with kitchen string or hold in place with toothpicks. In a medium saute pan, melt remaining tbsp butter. 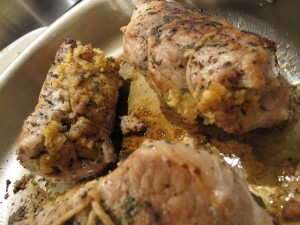 Place stuffed pork chops into pan and sear on both sides until golden brown. Pour brandy into pan, use tongs or a wooden spoon to get up some of the browned bits on the bottom. Place pan into oven, roast pork chops for about 15 minutes until cooked through (about 140 degrees for slightly pink and moist). Remove pan from oven, put pork chops on plate. Place pan back over heat, add white wine and a bit of the leftover stock. Scrape the bottom of pan, creating a little pan sauce. Drizzle over pork chops. Serve with baked apples and a salad.